President Jefferson Davis at the Confederate White House in Richmond, Virginia... the capital of the Southern Confederacy. The first and only motion picture ever made about the life of this American President. Chip Addison from Roanoke, Virginia, portrays young Jefferson Davis before the war. He is a marvelous actor who brings to the role a solid presence, a class and a breeding which one would expect to see in the real Jefferson Davis of the period. A veteran of over 50 dramatic stage performances, Chip Addison is the ideal choice to carry the role of Davis before the war. A fortunate discovery was made at Fortress Monroe; we saw a photograph of Davis in 1832. Jim Bazo is, of course, President Jefferson Davis, professionally. There is not much he does not know about the life of this great man, and he also has that bearing one would expect in the man, himself. Jim Bazo takes the role once Jefferson Davis is appointed the president of the newly-formed Confederate States of America. This two hour motion picture is as correct and accurate to history as possible. This movie is available from Amazon.com by clicking this link. 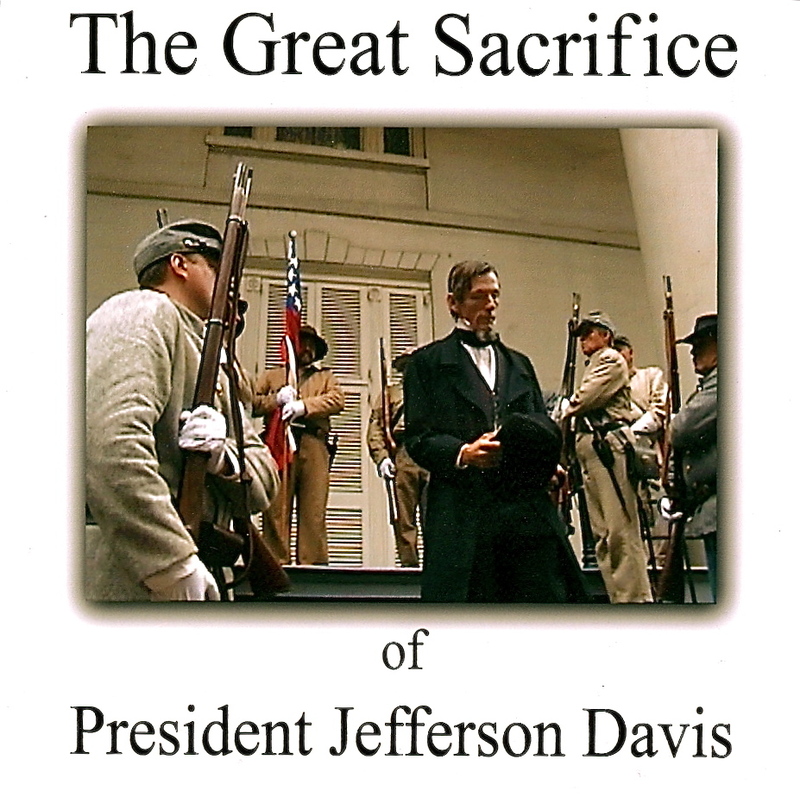 The Great Sacrifice of President Jefferson Davis is the first and only film ever made about the life of Jefferson Davis. Named for our nation's greatest president, Thomas Jefferson, Davis lived up to the name, living and dying by the exact same Southern political Conservatism as that founding father. Colonel Davis had already lived a complete and successful life well before 1861. A wounded and decorated war hero, Davis was a twice-elected Senator from Mississippi, and a friend to not less than five United States presidents. He was assured that position for himself, had he wanted it... but he did not! He was appointed the president of the newly-formed Southern Confederacy in his absence, and against his wishes to ever be such! He was arguably the best secretary of war this nation has ever had, trebling the size of the army which, one day, when taken over by a totalitarian 'blue state' majority, would absolutely and completely destroy his antebellum world of Southern charm, grace, and Conservatism. This movie was filmed at the Museum of the Confederacy in Richmond, Virginia, St Paul's Episcopal Church in his actual pew, at Hollywood cemetery by his five year old son's grave, Niagara Falls in Canada, and even some scenes filmed at Fortress Monroe, from his actual cell. There is also a chronological series of battle footages from First Manassas (at Cedar Creek) to Appomattox (the 140th)... and most everything in between... Search CaptBeauregards on Youtube for other films from Confederate Pictures... at Dixiepedia.org - or from Confederate Pictures Film Studios here on Yolasite.com. Also visit www.kennedytwins.com for the most excellent book The South Was Right!, other fascinating books, and an introduction to the Anti-Federalist party of Thomas Jefferson. Also visit confederatereprint.com for other wonderful Southern book and movies! Also read America's Caesar by Greg Loren Durand. And, coming to Amazon.com in the coming months... the follow-up to the motion picture, The Great Sacrifice of President Jefferson Davis... the first complete and comprehensive documentary ever made about the real Jefferson Davis. 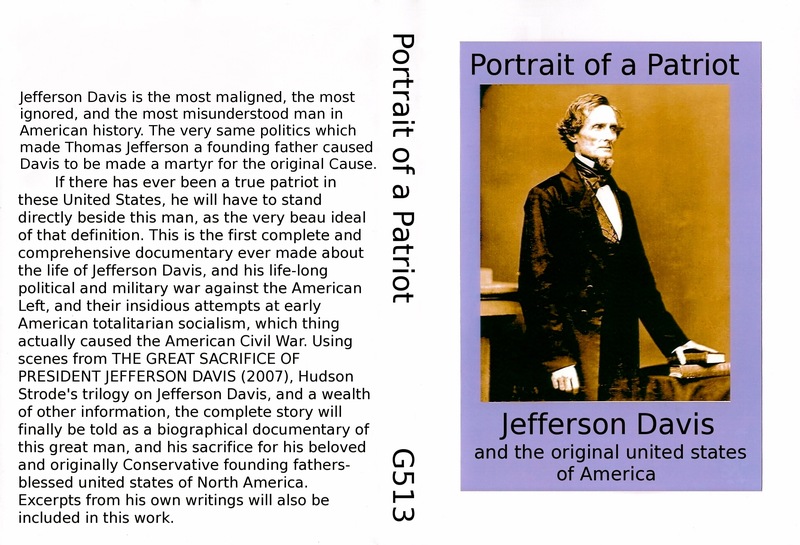 PORTRAIT OF A PATRIOT - JEFFERSON DAVIS AND THE ORIGINAL UNITED STATES OF AMERICA. The South Under Siege 1830 -2000 by Frank Conner. America's Caesar by Greg Loren Durand.